A team of scientists have won over £1 million to monitor the effect of storms on pollution in a river – estuary in Hampshire. Excess concentrations of phosphate and nitrate in river water, originating from fields, crops and sewers, are some of the major pollutants affecting Britain’s rivers and estuaries. These nutrient enriched waters can cause severe problems, such as stimulating the growth of excess algae that depletes oxygen from the water, causing widespread death to fish or causing the growth of poisonous algal species (red tides) that can decimate shell fisheries. Using the Hampshire Avon and Stour rivers and Christchurch Harbour in Dorset as examples, the team will spend 12 months measuring nutrient water quality and examining pollution levels when sediments in the estuary are stirred up by storms. They will also look at how sudden storms affect the input of nutrients and biological activity in the estuary. The work is crucial because climate change means that the intensity and frequency of storms are likely to increase. Results of the study will be used to create a powerful statistical model of the distribution of excess phosphates and nitrates, how they transfer from rivers, through estuaries and into the coastal seas and the role that storms play in this process. The team anticipates that this will allow policy makers to make more informed decisions about how to reduce nitrate and phosphate pollution in our estuaries. The scientists are part of a consortium from the Universities of Southampton, Portsmouth and East Anglia and the National Oceanography Centre, Southampton which has won a Natural Environmental Research Council (NERC) grant of more than a million pounds. The consortium leader, Professor Duncan Purdie from the University of Southampton says: “This study focuses on Christchurch Harbour which has the advantage of being an enclosed estuary with two of the South’s major rivers, the Stour and Hampshire Avon flowing into it and with one narrow connection to coastal waters of the English Channel. “Approximately 40 per cent of the world's population live within 100 km of the coast and estuaries making them some of the most vulnerable sites for impact from man's activities. 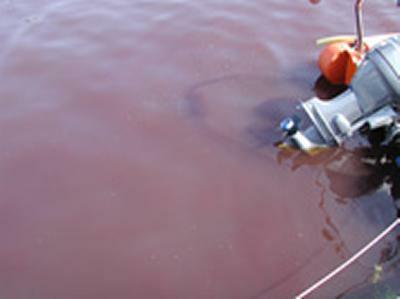 Pollutants such as runoff from fertilised fields and discharge from sewage treatment plants are gathered by rivers from large areas of the interior and accumulate in estuaries and this is aggravated by storm activity. Previously most water quality monitoring in rivers and estuaries has taken place at fixed times that are spaced too far apart to capture storms when they occur. The project is the first in the UK to monitor water quality in estuaries using sensors and weather prediction technology to anticipate a storm. The multi-disciplinary project is led by Professor Duncan Purdie from Ocean and Earth Sciences at the University of Southampton. It involves physical, biological, chemical and statistical scientists and is part of the NERC’s Macronutrient Cycles Programme (http://macronutrient-cycles.ouce.ox.ac.uk/) which is part of the broader Living with Environmental Change Partnership. The project will interact with the wider public in a number of ways including through a dedicated website, a brochure containing summaries of findings for general distribution, and several workshops for scientists, stake holders and officials in many government agencies and non-governmental organisations that may benefit from the project results. Outreach activities will involve possible field experiences for local school children around the Christchurch Estuary.